The impetus for this review started more than a year ago, when I first saw Soledad Barrio as Antigona in a performance that transformed my perception of what’s possible when dance, energy, spirit, innovation and impeccable technique come together. Under the direction of Artistic Director Martín Santangelo, Barrio (Santangelo’s wife) and a seasoned ensemble brought new life to a classic Greek tragedy with passion, live music and the relentless, explosive clicking of heels. I was enthralled, and vowed that when the company returned to New York, I would review it for ExploreDance.com. Fast forward to January 2017. 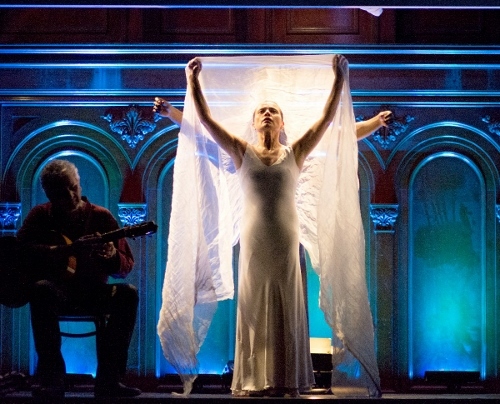 La Noche Flamenca was again at West-Park Presbyterian Church—an unconventional theater well suited to the unusual coupling of Sophocles and flamenco. After seeing Antigona again as an audience member, and reassuring myself it was as powerful as I remembered, I returned the following week on January 24 as a reviewer. The story of Antigona — daughter/sister of Oedipus, who is both husband and son to Jocasta — is rife with grief, hubris, repentance, nobility, love and death, all of which are heartily conveyed by Barrio and the ensemble. Beginning heavily with a prayer to break the curse on the family (realized when Oedipus killed his father to marry his mother), the show then draws the audience into the family and the tragedies to come. Running 90 minutes without intermission, Antigona is fueled by a cascade of events, crescendoing to Antigona’s exile and death. Although mostly in Spanish, with brief translations displayed on a screen above the proscenium, the gist of what’s happening is always clear — body language and occasional grunts say it all. Highlights include the war (dance battle) of Antigona’s brothers Eteocles (Robert Wilson) and Polyneices (Carlos Menchaca), pitted against each other at the gates of Thebes, dancing as though their lives depended on it (and they do!) 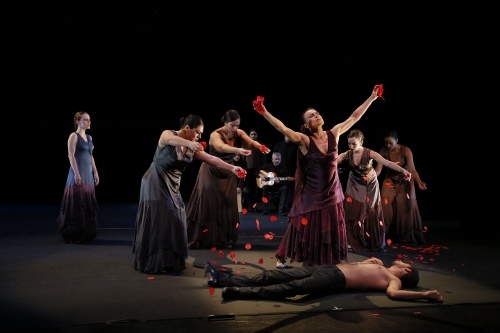 with both flamenco and hip hop/B-boy moves; Antigona’s powerful display of mourning at the burial of Polyneices; Haemon (Juan Ogalla)’s ardor and frustration, as his love for Antigona is conveyed with stomps, twists and turns; and Antigona’s frenetic solo in the cave where she will ultimately hang herself. Other performers of note include the blind seer Tiresias (Pepe “El Bocadillo”), a forbidding yet engaging character, and Creon (Manuel Gago), whose self-righteousness is off-putting to the point that I couldn’t wait for him to get his comeuppance. “There is no happiness where there is no wisdom,” concludes Tiresias, after Creon recognizes his folly in condemning Antigona, subsequently losing both her and his son. The tragedy has reached its inevitable conclusion, bringing with it a catharsis for the audience, as well. The highest praise I can give to any theatrical event is that it engaged me emotionally and somehow changed me. This novel portrayal of Sophocles’ tale changed my conception of flamenco dancing — and Barrio’s magnetic performance is an inspiration.